Final Fantasy II is, in many ways, one of the “black sheep” of the series. Originally released in Japan way back in 1988, Final Fantasy II never saw the light of day in the rest of the world in its original NES (Famicom) form. Instead, it screwed up Final Fantasy’s numbering system in the West, turning Japan’s Final Fantasy IV into the West’s Final Fantasy II, and Japan’s Final Fantasy VI into the West’s Final Fantasy III (As you can see, neither Japan’s Final Fantasies III nor V were released in the West either). In addition to causing huge amounts of numerical confusion, Final Fantasy II also departed in several important ways from the gameplay of its predecessor, as well as that of its successors. In an interesting coincidence, this makes Final Fantasy II one of a number of NES sequels that went on to become “black sheep,” such as Super Mario Bros. 2 and Zelda II: The Adventure of Link. Final Fantasy II Anniversary Edition follows Firion, his friends Guy and Maria, and Maria’s brother Leon, all of whom are forced to flee their home in the Kingdom of Fynn after an invasion by the evil Palamecian Empire. Firion, Guy, and Maria wind up getting separated from Leon after being rescued by a rebel group under the command of Princess Hilda of Fynn. 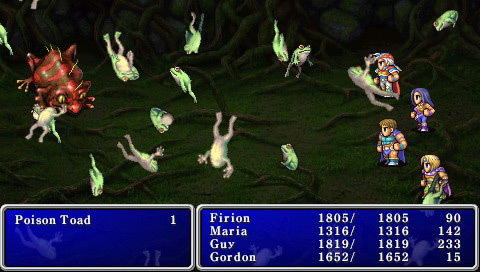 Firion, Maria, and Guy thusly join the rebels, and spend the rest of the story combatting the Empire, usually with the assistance of a rotating fourth party member, like the white mage, Minwu, and the dragoon, Ricard. As I’m sure you can tell, compared to Final Fantasy, Final Fantasy II ’s plot is way more in depth, which I found to be a very welcome change. In addition, the characters are actual characters, as opposed to the cookie-cutter “pick-a-class” characters who were the Heroes of Light, another welcome change. Another addition to the story’s formula is the addition of “Key Phrases.” These are important words that can be learned from NPCs, and are required at some points to advance the story, or to obtain guidance for your current objective. Speaking of guidance, it is still, on occasion, difficult to know what you’re supposed to be doing, but the greatly increased number of NPCs and the usage of “Key Phrases” alleviates this somewhat. As I mentioned at the start of this review, Final Fantasy II Anniversary Edition departs in some huge ways from the original Final Fantasy. Gone are the RPG staple experience points of old. Instead, characters grow from their experiences. What do I mean by that? Well, in Final Fantasy II, instead of gaining points that magically increase their stats from random monsters, the characters stats increase based on their actual experiences in battle. For example, a character that spends most of the time using their standard attack will have their strength increase more quickly, and in greater amounts than a character that focuses on magic. On the flip side, a character who likes fighting with magic will increase their intelligence, spirit, and MP (Magic Points) accordingly. Also, each of the game’s individual weapon types and magic spells have levels that increase through repeated use. This system allows any character to use any weapon or magic, allowing players to build each character however they wish. While this level of customization is nice, the growth system makes it more difficult to grind your way out of a tough spot, since it’s hard to tell when any stat is going to increase, or what exactly needs to be done in order to increase a stat. Fortunately, the game’s high encounter rate gives you lots of opportunities for growth. I realise that not everyone enjoys high encounter rates, but, as I mentioned in my review of Final Fantasy Anniversary Edition , I find it cathartic. The battles, unlike the growth system, are standard turn-based fare. While I was talking about the story, I mentioned Final Fantasy II ‘s occasional lack of direction or guidance. Well, there’s a little issue regarding the world map that makes the lack of direction occasionally very frustrating. The map is designed like a big ring filled with water. There’s a small straight in the South that provides the only sea access to the outside of the ring. Oftentimes, the only way to reach areas on the outer edge of the ring is by sea (until a certain point, anyway). If you don’t know where you need to go, you might have to sail back and forth, through the ring and around the outside over and over until you figure out where to go. Couple this with the high encounter rate, and even I got a bit annoyed. A smaller, almost inconsequential complaint I have is that when looking at the in-game bestiary, it takes the music a few seconds to load, making it difficult to browse quickly. I also noticed the game loading during battles, but that was very uncommon. Final Fantasy II Anniversary Edition also contains a bunch of extra content not available in the original release; the CG FMV and art gallery from Final Fantasy Origins on the original Playstation are the least of these. The game also includes the very difficult Soul of Rebirth side story from the Game Boy Advance version of the game, and the newly introduced “Arcane Labyrinth” dungeons. The Arcane Labyrinth is a series of dungeons that are required to obtain powerful weapons for each of the game’s characters. The dungeons require the use of Key Phrases to remove seals and advance. 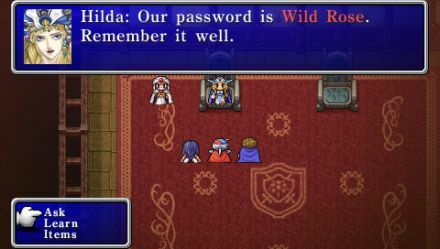 The Key Phrase used determines the appearance, enemies, and difficulty of the next floor of the dungeon. Many floors also contain puzzles that reward you with a new Key Phrase, or a hint to use on a different floor. There are way more Key Phrases than there are floors of the three main Arcane Labyrinth dungeons, so if you want to see all the different floors, you’ll have to return multiple times. Unfortunately, there’s no way out of the dungeons except by dying or completing it. You can’t save, either, so you have to finish each dungeon in one sitting, which could be difficult in some circumstances. Looking for the breakdown and score? Go to page 2!